The South Korean national team has by far been the most dominant team throughout the history of Sport Taekwondo. With countless Olympic, World and Asian champions the Koreans are always at the forefront of major competition. Of late, many people believe that Korea are falling behind and are getting caught up by countries such as Chinese Taipei and Iran, but as the profiles show below, the Koreans have no intetions of slowing down. Here are some profiles of some of the most experienced Korean players on the World circuit. As their records show the Koreans can still be considered the best team in the World. 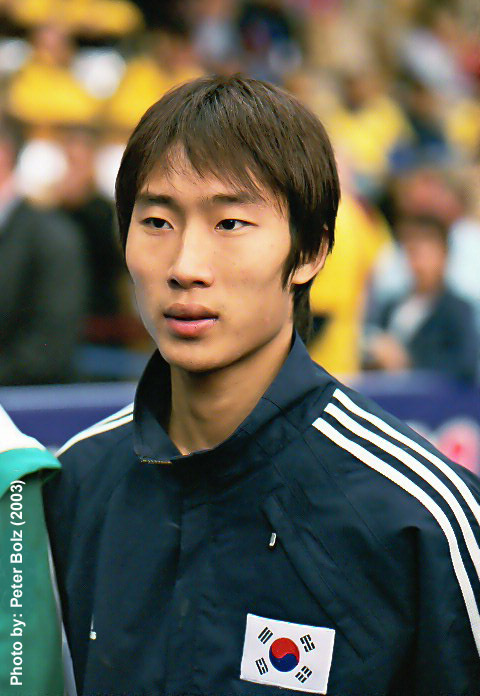 Yeon Ho Choi has not been seen on the Korean National Team for 2 years now and made a dramatic comeback this year by taking gold in the 2003 World Taekwndo Championships. He has a unique style of play and it serves him well as he wins most of his matches confidently and with ease. He won his first major title in 1998 when he won gold at the Junior World Championships by beating Chu Mu Yen in the final. Three years later he won the World title by beating Chu Mu Yen again in the final with a stunning display of Taekwondo by both competitors making the score 7:2 to the Korean. This year however, Yeon Ho Choi's performance was not so spectacular. He barely managed to get through the early rounds by winning by only a point or two. However he easily won his semi final over Azerbaijan but was very fortunate not to lose the gold to the aerial legwork of the UK's Paul Green. Nevertheless Yeon Ho Choi's performance and consistency has definitely earned him the number 1 spot in Fin weight division. Seok Hwa Ko is an outstanding Fly weight player and certainly one to watch out for in the future. Although he only began his International career in 2002 he already holds an impresive 2 Gold's and 1 Bronze for the Korean National Team. His rivalry with Kim Dae Ryung for the Fly weight spot on the Korean team is renowned and extremly fearce! He has a classical style of play when he fights and usually dominantly holds the centre of the ring in his matches. His finest performance was in the 2002 World Cup where he beat a number of impressive opponents to win his 7-7 final with Turkey's Kivanc Dincsalman. In the 2003 World Championships he won a number of early matches against tough opposition such as the current Olympic Gold Medallist Michealis Mourotsos. He lost in the semis however by decision as he lost his match to Behzad Khodadad Kanjobeh from Iran 11-11. He showed he is still a top player at the fly weight division by winning gold at the 2004 Asian Championships. By far one of the most experienced and honoured players on the Korean team. At the young age of 22 Nam Won Kang is already a 4th Dan and has a record a mile long. In 2001 he finally won the World title leaving only the Olympic Games Gold the one thing missing of his career record. In the 2003 World Taekwondo Championships he moved up a weight category into -67. However despite this fact he still destroyed all opposition to secure himself another well earned World Title. We still have plenty more to see from Kang Nam Won.